On July 24th, I was awoken by one of the lab nurses to take my blood. I think it was around 6.00 a.m. The last few draws had shown an increase in my liver enzymes, and my platelet count was getting lower. In short, the liver and kidney failure that accompanies pre-eclampsia was starting to happen. In trying to prevent pre-eclampsia from becoming eclampsia (seizures), an IV of magnesium sulfate was started on Monday, July 23. When Dr. Francois told me Monday morning that I needed to start mag, I asked if I could take a shower before the IV was started. One of the many things I had learned from my experience at the hospital is that it’s much easier to bathe without an IV. Standing in the shower on Monday, I had a feeling it would be awhile before I would feel this good again. I had heard horror stories from the nurses on what mag does to women: vomiting, lethargy, blurred vision–it makes you feel lousy. It seemed that everyone in the antepartum unit is given it–usually to stop pre-term labor. I was very disappointed that I was to join this group, but I was still eight weeks from my due-date. Dr. Francois wanted to keep me pregnant as long as possible. Although my blood pressures rose over the weekend and the lab results were not good, I told Dr. Francois I’d rather take the risks and let the baby grow as much as possible. The baby’s growth was what we were going to check that day. Three weeks earlier, the baby had a growth ultrasound and made interval growth (was still not the size of its gestational age but had grown three weeks worth since our last ultrasound on June 12). I remember feeling so relieved on July 3rd and hoped we’d get the same results today. I really felt like the baby was getting bigger. I was doing hydrotherapy (sitting in a bath for 30-45 minutes) twice a day for weeks, and Errol agreed that I seemed bigger. He told me I had gotten quite a few more stretch marks on the bottom part of my belly where I couldn’t see. Apparently, it was just wishful thinking. The tech, nurse, and doctor were all very quiet during the ultrasound a few hours later on Tuesday morning. They had brought the ultrasound into my room and had me positioned in a way where I couldn’t see the screen. I glanced over at Errol while they were measuring to see if I could read his face. He just stared at the screen. With my blood pressure so high and the baby in a breech position, Dr. Francois did not think it would be safe to try a vaginal delivery. Around 9.00 a.m. she told us she’d be performing a caesarean section at 12.30 that afternoon. Errol immediately got his phone and made the necessary calls. I remember lying on the bed praying that everything would be okay. I wanted the day to be over, and I wanted the baby to be normal. I tried to watch TV, but I couldn’t. I could not let my mind wander. I just wanted to cry. I kept staring at the clock and wishing my mom was there to reassure me. Errol told me Kate was coming, but I knew she wouldn’t get there until the surgery was over. A nurse came in that specialized in section deliveries, and she told me that she would be taking over as my day nurse. I did not like this woman most of the time and have blocked her name out of my memory. She was very eager to get me ready for surgery. She wanted to shave me and insert the foley as soon as possible. I pleaded with her to let me go without the foley for as long as I could. I asked her if we could wait till I was in the OR. She told me that was possible, but it’s easier to do it before they go. I thought, “Easier for whom?” At the beginning of my hospital stay, I had a foley in for a few days and hated it so much. I was very uncomfortable, and I did not want my last hours of being pregnant to be more uncomfortable than they had to be. She relented and prepared the area where my incision would be. Noon came and went. At 12.30 I was still in my antepartum room and still pregnant. This last hour was absolute torture. Earlier, I had been figuring, “three hours from now it will be over,” then two hours, then one hour, etc. The anesthesiologist came in to give me some medicine that I needed before the surgery. I didn’t like this doctor at all, and he and my nurse made idle chit-chat while they were examining me. Apparently, the nurse’s husband was also an anesthesiologist. I remember thinking I wish I were anywhere but here. In the mean time, Errol had put on the scrubs they had given him. I was so jealous. I wanted to be the one getting dressed just to watch. Shortly after Dr. Francois came in (still in the pretty dress I had seen her in at the ultrasound) and looked at my chart (it was a notebook by this time). She asked the nurse why she had given me so much of the medicine. The nurse replied she was just following the orders of the anesthesiologist. Dr. Francois was not happy and told her she needed to ask her before giving me any medication. She told me that there was a back up in the OR, but I was going soon. She’d see me in there. Not long after, I was wheeled into the OR. The trip to the OR was frightening and very short. For the month I had lived in the hospital, I never realized how close the OR was. The room itself was cold and incredibly bright. The first step toward the section was for my spinal to be administered. For some reason, Errol was not allowed in the room for the procedure. The procedure for me was awful. They warned me that I might have the sensation that I was having trouble breathing because the medicine would numb the muscles that allow you to take a deep breath. As it was being placed, I remember sitting up and curling my back in a way where my lower back was sticking out and my shoulders hunched. The nurse was holding me tight in almost a hug. This was the time when I liked the nurse. At this moment I needed some nurturing, and she was there holding me and telling me what a good job I was doing. I hated the medicine that they injected. Hours after the surgery it caused me to hallucinate. The wallpaper started to swirl, and I had visions of my mom coming into my room and running to my bedside. When I told my night nurse about this, she said that it was a side effect of the epidural. Just another reason why I want a natural labor if I have another child. Immediately following the spinal, I was placed on my back, and Dr. Francois came in the room–this time in her blue scrubs. I don’t know what happened, but I heard Dr. Francois say, “We need to get baby out now.” I felt lots of pressure and the tearing and pulling on my abdomen. I heard a man say, “Is Dad in here? We need to get Dad in here.” They had started the surgery without Errol. I remember trying to arch my back up and reach out for someone to hold my hand because it hurt so much. Finally (to me), Errol came in the room. They asked him if he wanted to watch. He was very hesitant to look beyond the curtain that was draped in front of me. I don’t know exactly when the baby came out. All I heard was, “There are no digits on the left hand.” I don’t think I absorbed this information. I just wanted to know if it were a boy or a girl. I heard Errol ask, “Is she okay?” I thought, “Oh, good, it’s a girl.” All my nurses had told me that I should hope for a girl because girls fight so much harder and do better in the NICU. Then the doctor said, “You can ask her, she’s awake.” Errol was asking about me—not the baby. Then I heard a woman ask if I wanted to see him. I looked at Errol and asked, “It’s a boy?” He nodded without much of an expression on his face. The nurse held up a tiny, tiny thing wrapped up in a blanket. I know most mothers fall in love with their babies at first sight, but I was scared. He was so small and had this grayish tinge. I remember thinking that I was happy he was a boy because he would never have to go through what was happening to me. 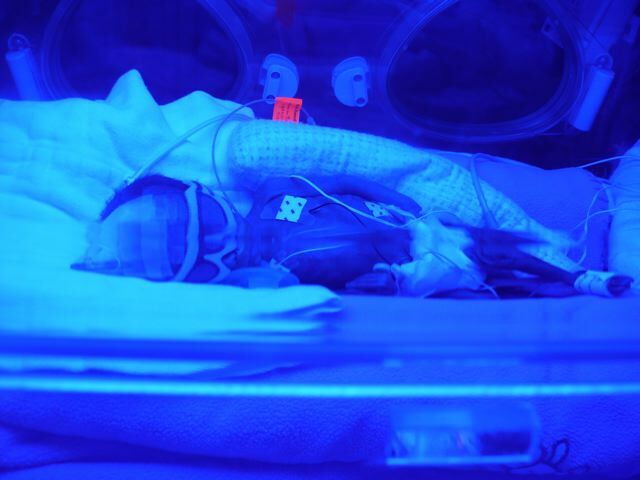 Most dads follow their preemie babies into the NICU, but Errol stayed with me. I needed him. He stood beside me while Dr. Francois and the others talked about Harry Potter while they were closing me up. As she worked, Dr. Francois warned me that there would probably be a lot of bruising because they had to get the baby out so fast. They couldn’t ease through the layers to get to him—that was the pressure and pulling. They couldn’t wait long enough for the spinal to take full affect, and that was why I felt so much pain. Apparently, the dose of medicine the anesthesiologist gave me had been too much for a woman with pre-eclampsia. (That was why Dr. Francois was so upset earlier). The baby had gotten used to the hypertensive environment; and when the high dose of anesthesia lowered my blood pressure too much, the baby went into distress. His heart rate fell rapidly and got as low as the 20s. Luckily, they got the baby out in time, and his brain was never deprived of oxygen. Later they tested the umbilical cord, and its oxygen levels were that of a normal baby. Luckily, I had relented and my nurse had inserted the foley before we left for the OR. I’m so glad this was the case because every second did count. Thomsen Fitzgerald Lord was born at 1.15 p.m. and weighed only two pounds. 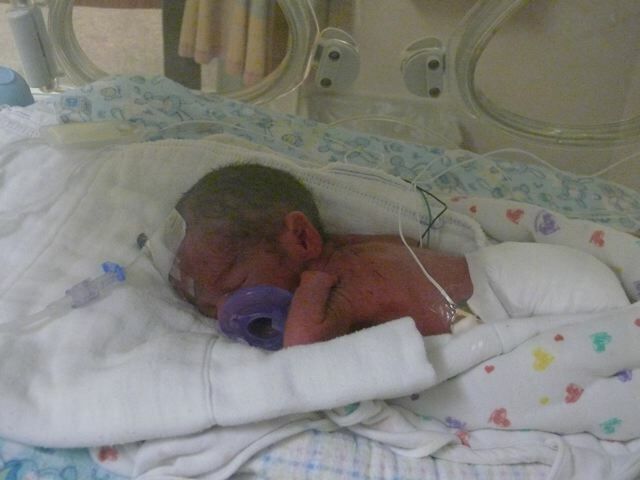 Although he was born at 32 weeks, he was the size of a 27-weeker. Dr. Francois did not have an explanation or a guess on why Thom didn’t grow the last three weeks in utero. She did say that my placenta was about the size of a baseball—half the size of a normal placenta. A few weeks post partum I was tested for a genetic clotting disorder to see if that was the reason why the placenta was so small. The test came back normal. As for the lack of digits on Thomsen’s left hand, there is no explanation for that either. The best answer they could give us is that there were amniotic bands. Some of the tissue that builds up in the amniotic fluid got wrapped around his fingers, cutting off circulation and essentially killing the finger growth. This news was the hardest for me to deal with. It wasn’t just a premature baby that would be in the hospital for weeks, it was a defect that my baby would have to live with his whole life. I don’t think anyone that does not have a child with a limb difference will ever understand what it feels like. After he was born, I found myself watching TV commercials and noticing if the actor’s hands were both shown. I thought about every activity and wondered if Thomsen would be able to do it. I despised comments about his limitations. When someone told me flippantly that he would never play the piano, I felt sick with anger. I still struggle daily with Thomsen’s left hand but find strength and comfort in the internet community of those with children born with limb differences. I try to focus on all the good. I have a bright, beautiful, strong, and healthy boy. July 24, 2007 is a bittersweet memory. It was one of the worst and scariest days of my life, but it also brought me the greatest gift. Thomsen shortly after birth, July 24, 2007. Thomsen under UV lights, July 26, 2007. Wow what a story!! I can’t imagine what you were going through. Sounds like you were very brave!! My poor b.s. You are so brave to write your feelings and experience. It’s incredible to see all that you have gone through… AND how amazing he is. Man is that boy beautiful. Not to mention, your banner picture of him chewing on his little arm is ADORABLE and incredibly brave as well. Letting our kids just grow and celebrate them as they are is so important. You’re rockin’ it sister! Thomsen’s birth story is amazing! You narrated it so well, I felt like I was right there with you and Errol. I am still struggling to finish Addy’s. Congratulations on such an amazing year with adorable Thomsen. I hope we get the chance to meet in person some time!